These are turbulent times and we’re travelling in a bubbly part of the world. One day after we’d left Quetta (Pakistan) there was a severe earthquake just 70 kilometres off the city. Right now I’m watching the Indian coverage of Barack Obama winning the US elections in a hotel room in Agra, India; a special moment in history. Travelling through Pakistan was interesting and the images were beautiful, but as we were constantly escorted by policemen it was hard to really experience the country and its people. Whereas in Pakistan there seemed to be large areas with still a hugely ‘traditional’ lifestyle, crossing the border to India we entered an eclectic world of the new and the old, the rich and the poor. Sacred cows at the motorways eating the garbage alongside the roads; tuk tuks, walkers, bicycles, fancy cars and the occasional elephant all using the same road in a dangerous driving style. Bert and I drove to Delhi (an enormous city with 16 million inhabitants) for a concert that was scheduled for November 3rd in the outside auditorium of the Vasant Valley School. The concert was organised via Roger, the man who has lent his Landrover to us, by Round Table India (an organisation that does a lot of benefit projects) in support of their project, ‘Freedom through Education’ and they did an impressive job of organising it all. The main organiser Khushroo Kalyanwala, an Indian architect, invited us to stay at his house the first night and took us to the Delhi main TV station the next day for a live interview announcing the concert. We told about our journey and our aim to connect with people through music in all the different countries we cross and on the studio monitor I could see them broadcasting the both of us with the subtitle “Music with a cause” (quite an impressive title…). It was a nice, sparkly interview and we played two fragments of songs (“Follow the Heron” and “The snows..”). That evening we slept at the beautiful farm house of another man, by the name of Puneet Gupta, on the edge of town. The next morning Bert and I were taken to the school site and met with a sitar, tablas and harmonium player; three fine musicians with whom we rehearsed some songs for the concert later that evening (the traditional indian way, seated on the ground carpet together). 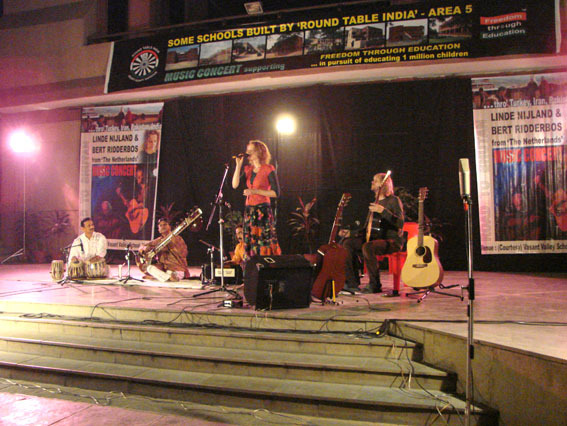 And the concert was a special event…in contrasting Indian style. Bert and I played two sets of 40 minutes, joined on some of the songs by the beautiful sounds of the Indian musicians and as we played our songs about..winds, seas, love, birds and spring in the outside concert room, every 4 minutes a noisy airplane flew over after it’d just had taken off from Delhi airport. Still we played very well I think and I enjoyed it a lot. Kind of surreal was the small media hype that took place that evening. For apart from Hans recording there were many, many cameras of multiple TV stations there filming the event with its unique mix of music, travelling and the good project. We were interviewed by three national TV stations (i.e. CNN IBN) as well as some smaller ones and it was definitely one of the highlights of the journey. We have crossed a large part of Iran and have just left the small desert village where we stayed for a few days. The houses there were made of yellow mud and earth in beautiful round shapes. It was my first time ever in the desert and this place was a real oasis..and felt like home. Yesterday evening we recorded Richard Thompson’s “Waltzing for Dreamers” in an old Karavanserai under the starry sky. 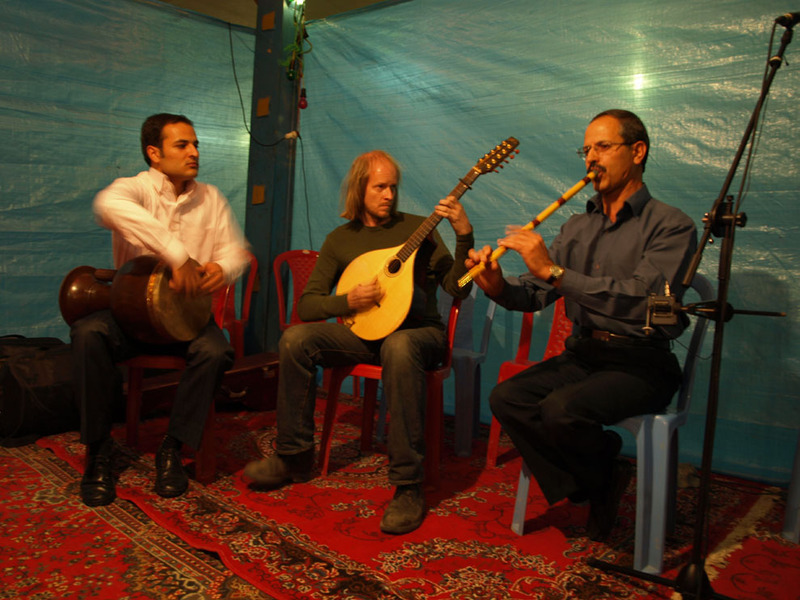 By now we have given three concerts in Iran. The first in the safety of the residency of the ambassador in Teheran for a mixed Dutch/Iranian company. This was a very special gathering since people hardly ever have the chance to visit a concert and never get to hear a women’s voice in public. I received such warm response afterwards..it was a joy to play there. 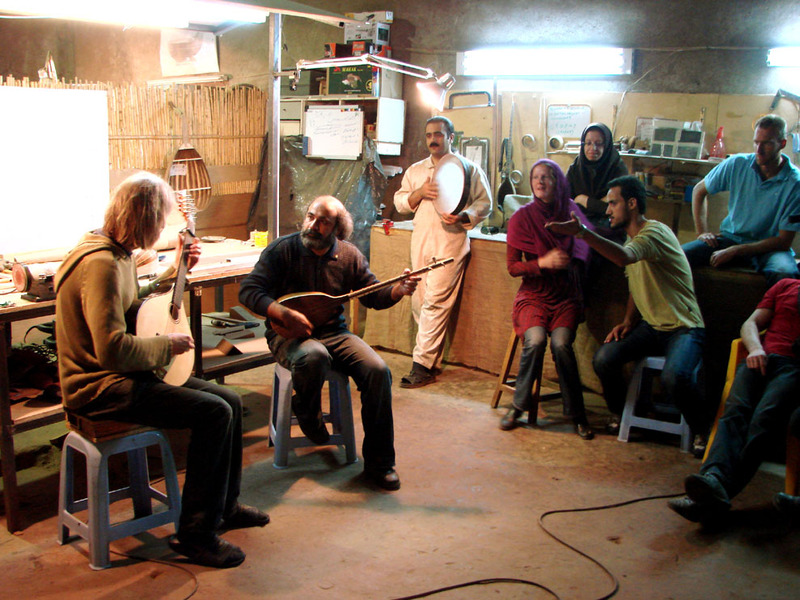 The people were very open to the music and it was nice to find out that audiences are the same everywhere (and this has been my experience in general while travelling through Iran. For contradictory to what some might think it is very safe here and the people are very, very friendly..). We also gave a small concert for sick children and nurses at Mahak Hospital in Teheran, where I was allowed to sing in public, which we were told is very special and unique for Iran. Finally we gave another precious concert..underground. And this was real underground music for even though the concert was private, the Iranian musicians involved were scared and a lot of precautions were taken.. We were brought to a secret location, with a secret password and all and gave a concert for a very sympathetic Iranian audience. It was a very good experience. Unfortunately Hans was ill that evening so we don’t have any film recordings. No user commented in " Berichten van het muziekweblog (3) "